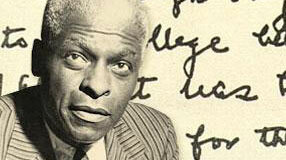 Benjamin Elijah Mays, AM'25, PhD'35, was the conscience of the civil rights movement. Treatment and research intertwine at the University's innovative new hospital. Exploring the attributes of low light, an architect and a physicist try to cultivate a dim awareness. An intimate look at the multifaceted man who launched two thousand internships. Economist Chad Syverson cites similarities with the age of electrification to explain productivity trends as information technology proliferates. In his new book, the UChicago evolutionary biologist shows how our bodies tell the story of the planet and the stars. In economics there are more settled issues than the public realizes, says UChicago's Anil Kashyap, who leads a project to change perceptions. Even in death, molecular geneticist Malcolm Casadaban continues to further the understanding of science and disease. Chicago Booth economist Emily Oster applies the principle of diminishing marginal utility to measure work-life balance. A webcast of "The Politics of Guns in America," a panel discussion moderated by Tom Brokaw, begins at 7 p.m. tonight. What's in a keyword? Mark Athitakis, AB'95, turns a critical eye on how the Library of Congress and the New Yorker classify fiction.